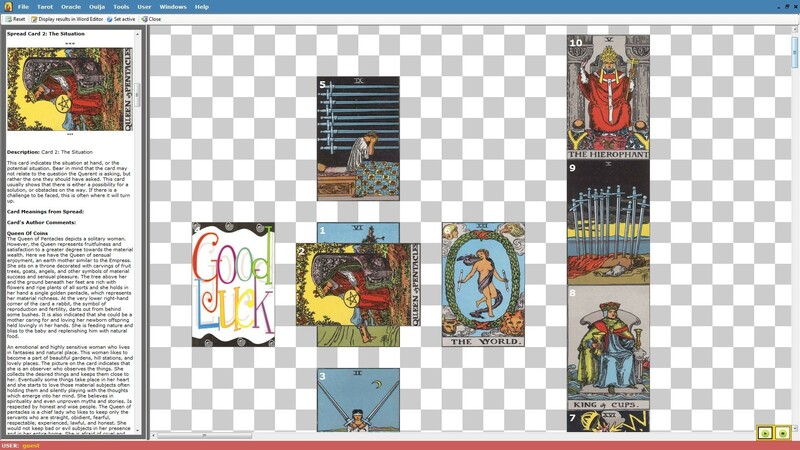 A new 2010 freeware Tarot and Divinity Software for PC and Windows 7. Edinamarry brings to you an open Tarot Scribe Kit by which you can create your own Tarot Deck and Spreads, and you can write your own readings and afterwards share your Tarot Deck and Spreads on Internet. Reversed Cards feature, Client and Customer Profiles features have been added in Edinamarry3. You can find answers to your questions with Tarot through Divinity, and Edinamarry is just built for this purpose. Edinamarry comes with a default Tarot Database. Tarot Decks are editable. Tarot Spreads too are editable. I am sure that you would be satisfied with the brief knowledgeable content of Edinamarry. You can print the reading results, and you can store the result as a file on your PC. There is a built-in integrated specialized Writepad in Edinamarry in which you can type your thoughts, and you can save your typed content which includes readings on chance, into Windows Write Format files rtf. Similarly, there's automatic Software Update Tool which can be used to automatically Update Edinamarry to the latest Version.